The best vision in the world without an accountable team to execute it will not get you very far. Rhythm is the only complete cloud-based software that streamlines strategic planning and execution for mid-market CEOs, executive leaders, and departmental teams – ensuring all employees are aligned and working toward long-term, annual, quarterly, weekly and daily goals. 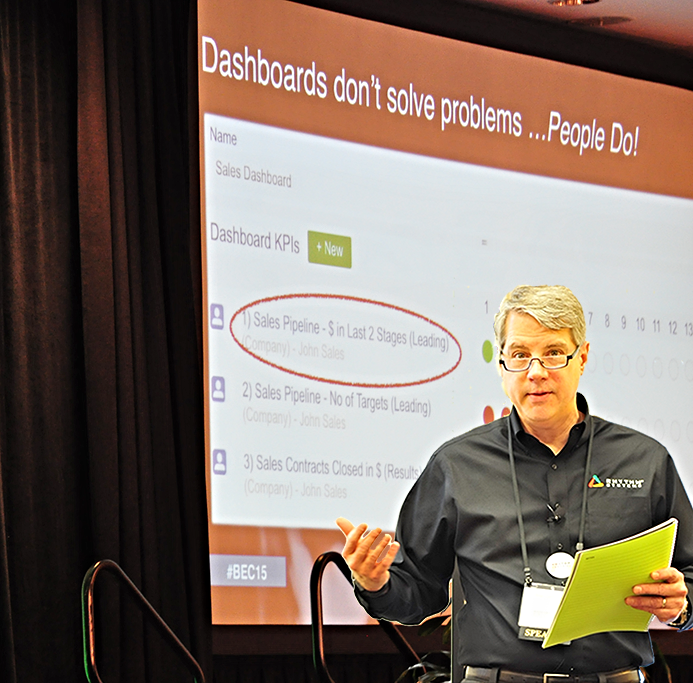 Hire well, create accountability and have the right performance conversations. 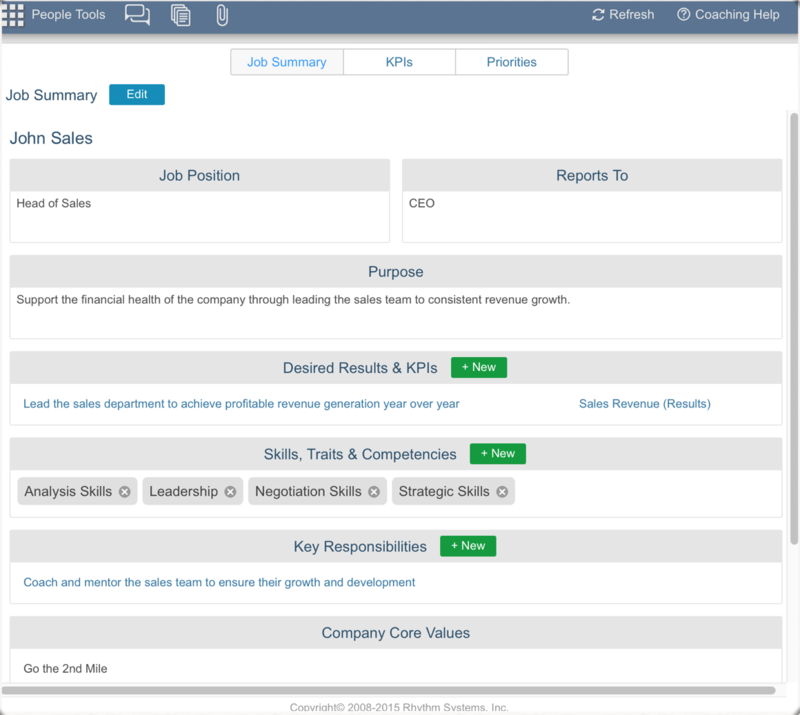 We've enhanced our Rhythm platform to now include a comprehensive Job Scorecard feature that will help you document job roles, understand and create KPIs to track desired results of those roles and track how well people are doing working against growth priorities in that role - every day. Leaders and managers can use these Job Scorecards to help their staff to understand these things to gain clarity in their roles. 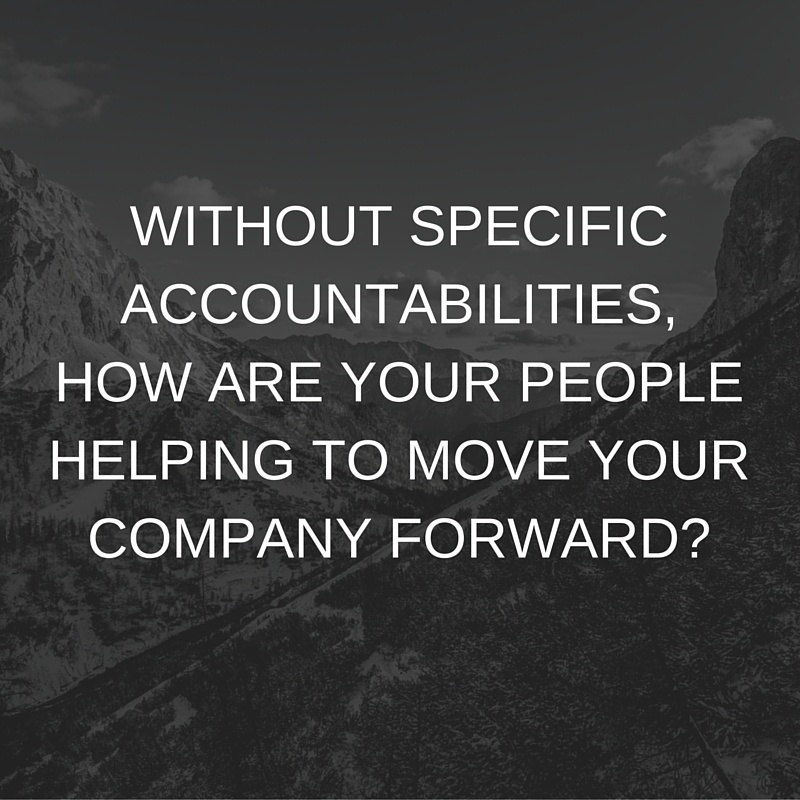 Identify the key seats in your organization and make sure that accountability for specific company results is clear. Use the Role Accountability Tool in Rhythm. List all of the key functional areas of responsibility in your company and the name of the person who is ultimately responsible for the results in that area. Do you have more than one name listed next to any function? Does anyone’s name show up a lot more than everyone else’s? Are there any key functions that don’t have a name assigned? Would you enthusiastically rehire each person for their current role? What are the ultimate results expected for each function and how will you measure each? These are often very high-level results found as line items on your P&L Statement and Balance Sheet. For each position, identify 1-2 KPIs you can track to ensure that this person is on track to achieve the ultimate results. Job Scorecards clarify the purpose, desired results, skills & competencies and key responsibilities for each role in your company. Follow this simple model as you take the think-time necessary to get your arms around what, exactly, you need people to do differently. If you’re going to have a conversation with people around accountability (or the lack thereof), it’s important to first frame what it is (exactly) that you need them to do. The Job Scorecard is a perfect way to prompt your own thinking and to help you get very focused on specifics. This report will help you frame a performance conversation between you and your leadership. Designed to help you understand how you are performing against your goals and expectations and to gain feedback from others so that you can significantly multiply your contribution to the company, your team, and achieve success in your job. Some companies still have a formal process for Annual Performance Reviews. We believe that a better approach is to hire A players using Topgrading, clarify roles and expectations upfront using Job Scorecards set RYG success criteria for all KPIs and Priorities, display constant feedback on progress and performance through and provide support and make adjustments daily and weekly using a healthy meeting rhythm. If your company requires you to follow a formal performance review process, you can export the information captured in the Job Scorecard screens in Rhythm into the Performance Conversation Report and use the data to support your process. The first tab of the report includes instructions for how to use the report to frame a conversation between you and your leadership about your performance. Expert consultant every step of the way. Rhythm consultants have created over 150,000 KPIs and Weekly Dashboards for executive and departmental teams. Your Consultant will help you review and test your plan to make sure it passes the financial, accountability, focus and energy aspects. They teach you to collaborate as a High Performance Team to accelerate great execution. You will learn the Think, Plan Do Rhythm methodology which will help you establish the right habits to consistently meet or exceed your goals. Every Rhythm resource at your fingertips. 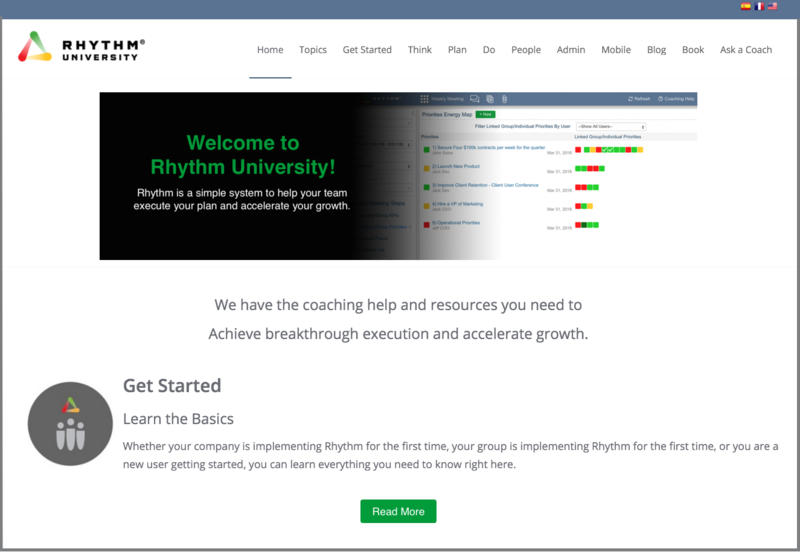 Learn the basics - whether your company, a group or a new user is implementing Rhythm for the first time, you can learn everything you need to know right here. Work on your strategy - We call this the Think Rhythm; working on the future of your business through strategic thinking. Learn how to use Rhythm to do effective Strategic Thinking to grow your business. Plan your year and quarter - We call this the Plan Rhythm; execution planning that helps teams and individuals understand what they are supposed to do. It requires figuring out the company priorities that will drive your strategy forward, and then making sure that every single person understands and is aligned with those priorities. Do the work and adjust - We call this the Do Rhythm; your process of getting work done and executing your plan. By being accountable to your plan, you can discover which critical adjustments need to be made and brainstorm options and opportunities. When we make adjustments proactively, we achieve our goals faster. Fast track to learning the Rhythm methodology. 4 different certification programs designed to teach concepts in small bites and can be taken at your own pace. Certified Rhythm Fan - knowledge and tools to implement Think Plan Do. Certified Rhythm User - understand the connection between strategy and execution and navigate the software to record an execution ready plan to run your quarter. Rhythm Group Leader Training & Certification - confidently lead an executive team or departmental group through all areas of Think Plan Do. Rhythm Expert Training & Certification - full access to all Rhythm data and the ability to provide systems administration of the software for your company. Call one of our Rhythm experts to get all of your questions answered. Schedule a demo to learn how Rhythm can help you create accountability by building high performance teams.